Once again, ejh's & my own taste in book covers are divergent! I do find the title a bit silly though. 'Perfect Your Chess'? No-one can realistically aim for perfection in chess, not even Rybka; the concept of perfecting one's own chess is unclear (is my chess perfect if I reach 200, say? ); the book is a series of very difficult problems so the title is only tenuously related to the content. But it's a good book, I think; and by curious coincidence will also feature in my post on Monday next week. If you reach 200 Tom you will be able to answer that question with a resounding no. The higher your strength, the more aware you are of how little you actually know. I am getting increasingly suspicious of how marketing has invaded chess and am very reluctant to buy any products these days. Work it all out through trial and error with a computer programme (yes I realise you need to buy one of them) and through your own OTB practical experience. Chess marketing seems no different to marketing in general these days- trying to make us buy things of little use that we don't need. Make better use of what you already have. Well of course . . . I guess the point I was making was, if each player's standard has a ceiling beyond which improvement is impossible, this would be a definition of 'perfection' for that player, but how can we ever know? And it's a big if anyway. 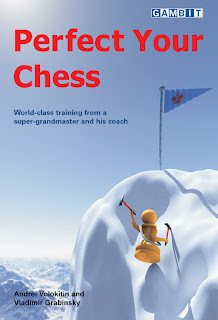 I think chess book titles typically tend to over-promise regarding direct practical impact, but I'm not sure that means their contact is necessarily un-worthwhile. Having said that, I do think chess books (especially opening books) have a serious rival in the computer. I think chess books can actually be dangerous as they are generally of the 'read and nod' variety. They therefore trick you into thinking that you understand things that you don't actually. Also the examples given can be highly misleading in that you think they are the norm but actually most games don't actually go like that. I also think chess books assume far too much in how much people calculate. Playing out positions on the computer given in books could be a happy medium between the two approaches. It could help you discover whether the author is telling you something of use or is just going through the motions to earn a crust. You make an interesting point in perfecting your chess for your own ability. Most people don't really want to consider this as they find it too depressing as to the standard they can reach. Rowson addresses these issues I think in his last book and whether (especially adults) you can reach a higher plateau. Yes. On most points I agree, although I think you can always improve your chess in small but concrete ways, e.g. 'I don't know how to mate 2N v P so will learn that today'. Something according to the latest NiC Anand never learned! My apologies for commenting here about comments in a three week old post regarding chess pgn viewers but I figured if I posted there it would not be noticed. Some comments there discuss ChessFlash and the ChessFlash terms of service. To clarify, those terms of service are intended for registering as a user of the ChessFlash web site, creating content and using the web site. The viewer itself is available under the GNU GPL license and does not require using the ChessFlash web site. You may make you own copy of the program and use it from your own web site. You may modify the source. You may place the pgn files on your own web site. You may, using the latest publishing tool at http://chessflash.com/chessflash.html embed the game score in the html of your post.